I made these ornaments for all the extra teachers at our schools, the mailman, party hostesses, and anyone else I just needed a little something for. 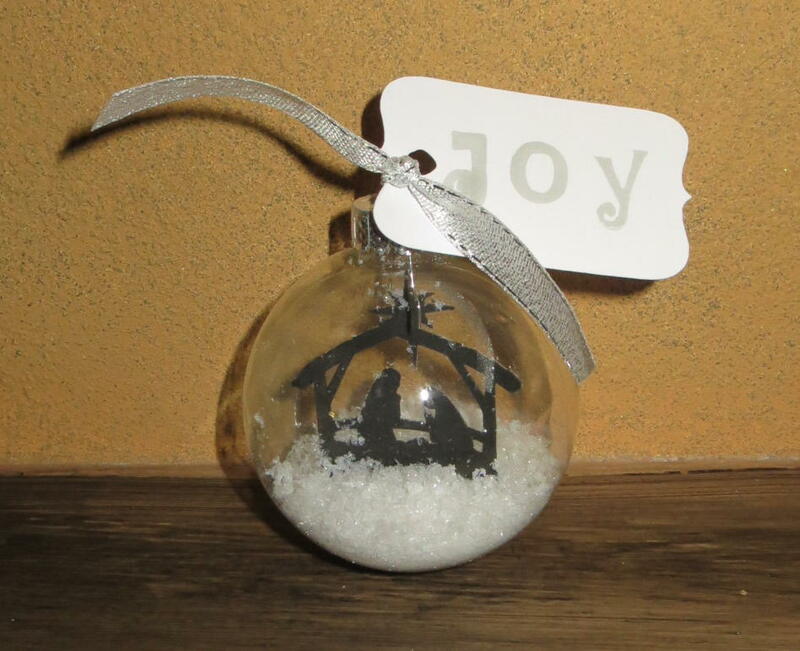 This beautiful nativity ornament came from THIS BLOG. There are detailed instructions for making it and I even bought their silhouette patterns from the Silhouette Online Store. I did add the white tag on which I stamped "JOY" and attached with a silver ribbon. 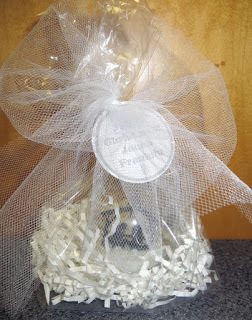 I put the ornament in a clear bag with shredded white paper and tied it up with white tulle and a "Merry Christmas" tag. You can download the gray 2" circle "Merry Christmas" tags HERE. I'm super happy with how they turned out. Thanks for the idea and patterns, The Sewer The Caker The Copycat Maker! For my girlfriends, I made this cute Mistle"toe" set. 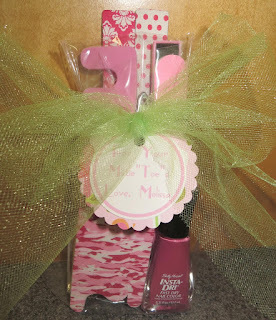 It contains nail polish, files, toe separators, and more! I made tags that say "For Your Mistle'Toe's". I printed them and cut them with my 2" circle punch. You can download these tags HERE. Then, I used my 2.5" scallop punch on some cute scrapbook paper. I put my 2 punches together and tied everything up with lime tulle. Fun & easy! I am a stay-at-home-mom to two great boys, 13 & 10 years old. I enjoy being involved with their activities and schools and am always on the look-out for cute party and gift ideas!